In between the step-out madness, I've been able to tackle a few projects that have been poking around the recesses of my cerebrum waiting for their chance to take form. Wonder Twin Powers ACTIVATE! (Okay, so I'm dating myself with that reference. Whatever.) 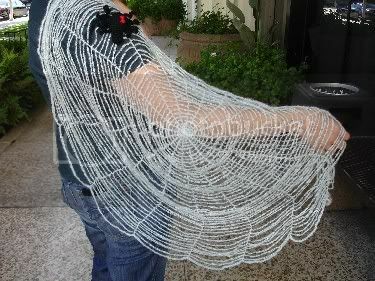 Form of a wearable web! Now, I am aware that I am not an arachnologist and my spideys lack a certain anatomical correctness. Peeps I'm good, but I'm not that good...However, your input, insights and suggestions with regard to my spidey mutant-ness are always welcome and appreciated! Anyway, this here webby is definitely a first draft. I'd really love to make one in a semi-circle shape, but until I've time to tackle another version this one is a decent first crack at the mesh phenomena. Stay tuned for more webs and wonders because October is creeping 'round the corner. Much more to behold has we enter the official season of Monster Crochet! And what will you do with all your webs once they are completed? Do tell, please. Wrap myself in a cocoon! Deneen, I think she will use them to catch unsuspecting knitters and crocheters and make them do her knit/crochet-bidding. Btw - I think you are giving me one awesome Halloween wardrobe idea. Very very cool. I think they spideys are perfect the way they are. If this stuff is any indication, you are going to be quite the sight on Halloween, please take a picture for us! Yesterday, we spotted an automated talking fortune teller's head in a crystal globe and, today, I see your gorgeous spider web....I'm giddy for the season all ready, I tell ya'. The web is WAY cool. The spider is good too, but I love the web. I like the spiders you will be known as "La Mujer Araña", your spiders are suuuupeeerrr coooolll! love the web. that is awesome! I look forward to the web's evolution, Charlotte :). Thanks guys! Actually, I think this one turned out really pretty. Methinks I need to try the next one in metallic something or other. Oooh it makes my spidey senses go all tingly. Metallic would be great! Especially silver. ack! this one kinda gives me the heebiegeebies - you just had to go and use a lace wt to make it all webby --- ugh... i can almost feel it! *shiver!! don't get me wrong, i love spiders... just not their webs! when we find them around the house, i always relocate them to my craft room---i like to think that the presence of spiders will keep away wool moths. good theory, no? I love the spiders! The web is really awesome, but I know I would just poke my arm through the web destroy it in the act of wearing it. But I could *so* completely cover a jacket with those spiders!!!!!!! Okay, metallic for the web (you have *got* to figger out a way to knit those so I can copy you! 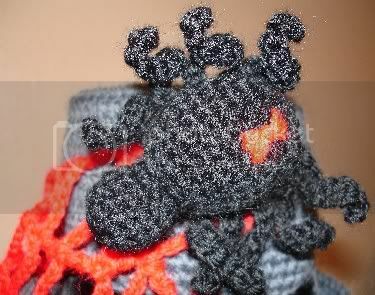 ), and add black/metallic fug fur to the arachnids!!! Or maybe just their legs. Hmmm. Would they then be french spiders? Awesome web and even more awesome eyeball corn. Whats the purpose of the eyeball corn cob? It's demented and I want one. Cool web !!!!!!!!!! Morticia Adams would be quite the fashion plate if she were wearing it. Truly beautiful with an emphermal quality to it. A shimmery metallic one would be awesome. And perhaps next a silky one? How about making it into a shawl kind of like the batwings shawl. Keep the same overall circular shape, but not join up one spoke. Wrap yourself in silk! I LOVE LOVE LOVE the WEB!! How cool is THAT???? I thought it couldn't get much better than all the food you've been doing. Oh My God! 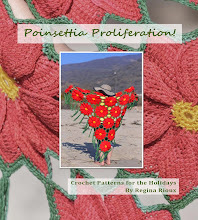 You really are a mad crochet genius! Oh my god Halloween is going to take on a whole new flavor this year! You should start now. I mean, you have the accessories to stretch this out for two full months. I love it - anatomically correct spiders or not. 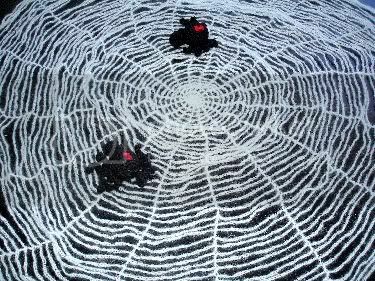 Very cool spider web and use of crochet! I imagine it attached all along a black sleeve underside, from underarm to wrist. Then also attached down along the side of the same garment. So when you raise your arm,the web opens up and the spider pops out! You can put it on your less-used arm so it won't get so tangled in stuff and you won't give away the surprise too easily. your web is awesome. i would say more but i am struck mindless by its power. No one has mentioned it yet, but I notice your excellent choice of spider - the BLACK WIDOW! I kind of love the web -- but I hate the spider!! That is great- so cool! Your patterns are so awesome! I think Halloween is our favorite holiday by far, so I will be purchasing lots of these to get ready!!! This is so funny! 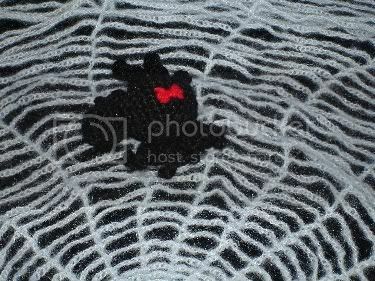 I just googled WearableWebs, the name of my new Etsy shop, and got you!